The call to create is certainly something deep within each of us, yet to take the next step and share our work with the world. Isn’t that the way of wonder, though? To witness the bravery of others? That’s just one of the reasons I loved reading Kelly Chripczuk’s new book of poetry Between Heaven and Earth as she took a collection of writings she’d been doing mostly for herself and then shared it with folks. It was a joy to sit down with Kelly and we dive into what it takes to write, raise a family, and manage all the idiosyncrasies of life. Café 101, a cute little coffee shop, is just a ten minute walk from my house, so we could meet there. I’ll have coffee and, if it’s morning, baked oatmeal. But, if one of my kids is home sick from school (as often happens this time of year) meeting in my kitchen will work too. I’ll just put on some water for tea or reheat a cup of coffee, and we can talk around our old butcher-block kitchen Island. I started writing my first book, Chicken Scratch: Stories of Love, Risk and Poultry, about four months before my youngest kids were due to start Kindergarten. 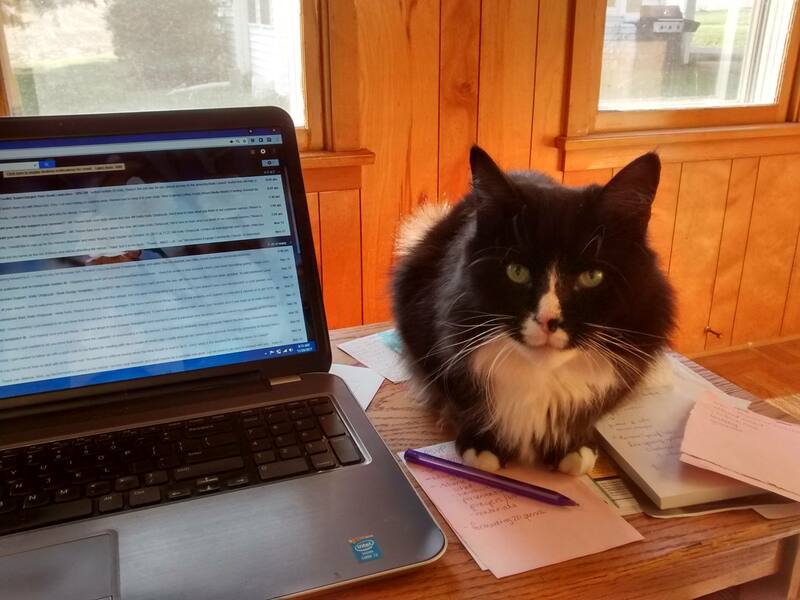 As a work-from-home mom, I was anxious about weathering the transition and knew I would need something to keep me busy – writing a book seemed like a good way to fill the time. For my birthday that year, I bought a flock of hens (because I also through selling free-range eggs might be a good way to fill the time). I decided I’d write about tending the chickens every day for a month and see what came of it. 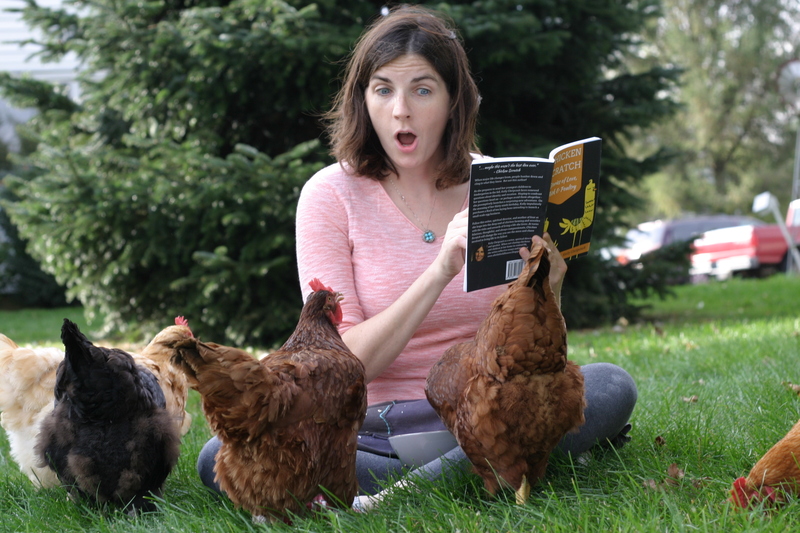 Six months later, after a lot of editing and revisions, I had a sixteen-chapter book filled with stories of love, risk and poultry. My biggest goals for Chicken Scratch were to learn about writing a book, to experience the self-publishing process, and have it be fun – both for me and for my readers. 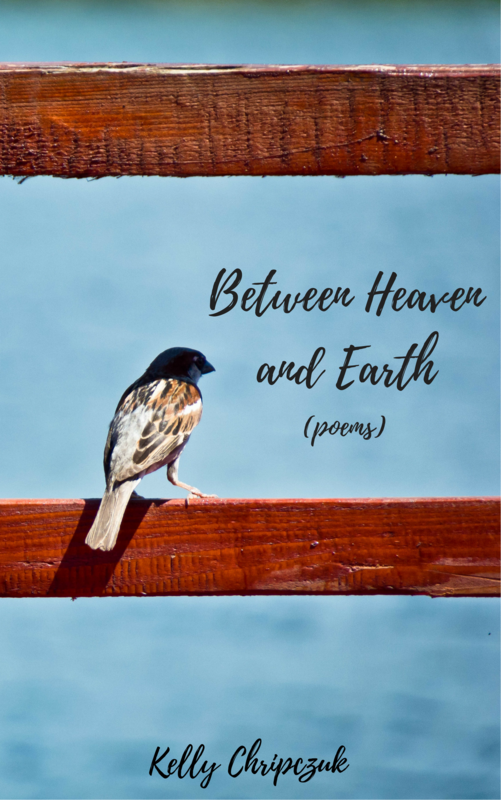 My second book, Between Heaven and Earth, is a collection of 45 contemplative poems that I wrote over the past five years. I’m not a disciplined poet, but I find it a helpful format for times when other forms of writing fail me. Between Heaven and Earth came out last week and, so far, I’m most excited to hear that people who “don’t normally read poetry,” are finding it accessible and engaging. My biggest goal for Between Heaven and Earth was to Just. Get. It. Done., as it’s something I’ve been meaning to put together for a long time. In what ways does real life inform your writing (and vice versa)? I wrote as an academic for years before I began writing creative non-fiction. As an academic, the rules were clear – real life wasn’t supposed to inform anything. 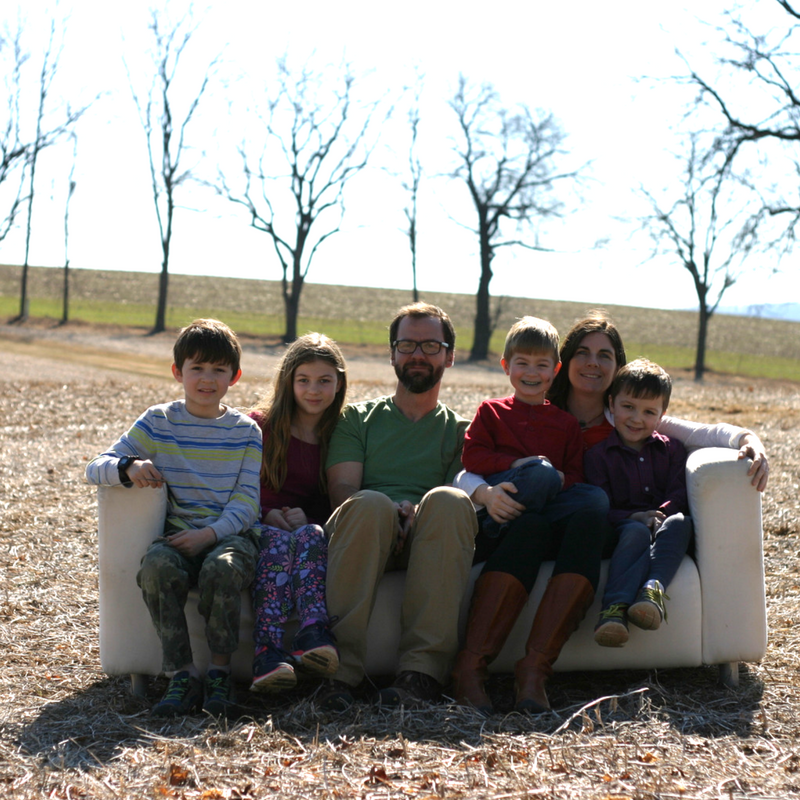 But, in 2011, we unexpectedly gave birth to twin boys, doubling the number of children we had from two to four. I left my job as an Associate Pastor and plans for a PhD in Old Testament were rather permanently shelved. In that time, just before the twins were born, I set up a blog online. Although a year passed before I published my first post, the blog became the one space in my life that was truly my own and the one way I could still have a voice outside the bulging walls of my own home. At that time, real life was the impetus for my writing. I wrote to understand and make meaning of the upheaval I was experiencing. I wrote to maintain a sense of humor because the things that were happening in our home were too crazy to be true. I wrote to survive – to believe we would survive – and to hold on to a sense of my own identity. All of that to say – there’s a very natural flow, for me, between writing and life because, for so long, there was no way to separate the two. As for writing informing my life, writing has helped me learn to risk more, to endure possible failure, to keep working and moving when the outcome is unknown. Devotion to creativity has deepened my faith in the goodness, wholeness, and possibility of life that make themselves known when we are committed to showing up. I stumbled into writing when I joined Facebook, just around the same time I became pregnant with twins. Facebook gave me an audience and aroused in me an awareness of my love of words. Something would happen and I would walk around all day thinking of the perfect way to phrase it to get a laugh online. After the twins arrived, the level of absurdity happening in our house (4 kids five and under) and my sense of humor made my posts more and more popular. People started telling me I should start blog and, eventually, I did. Once I began writing, I remembered how often teachers praised my writing in high school, college, and beyond, but no one had ever suggested I might be a writer. When I think of myself as a writer, I think of someone who loves words and enjoys the work of communicating things in a way that elucidates and/or forms a connection. What’s your best three pieces of advice for folks that write? The practice of writing shapes you – commit to the practice, rather than to an outcome. Be clear about why you write, and cling to that when the writing is tough, or you aren’t getting the outcomes you want. 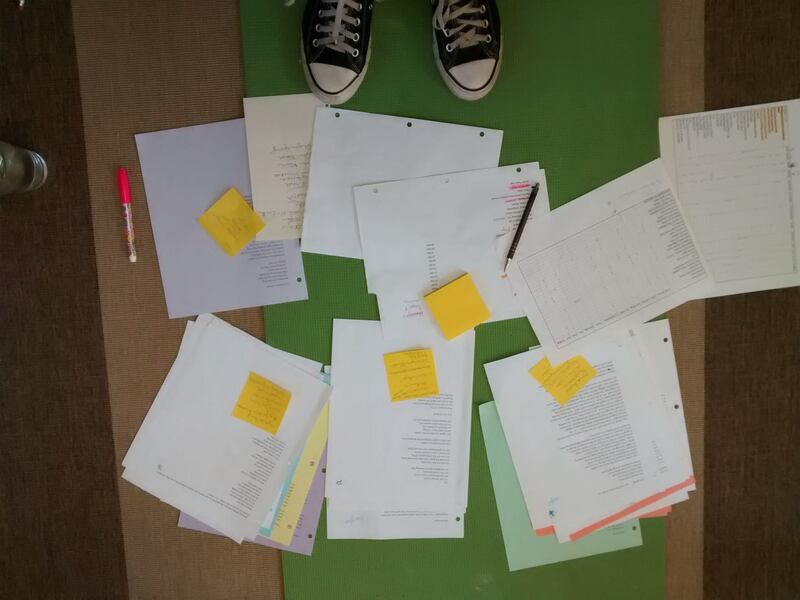 I write “for love and for joy.” When I get frustrated or start playing the comparison game with other writers, I try to come back to two central questions: Is writing helping me (and my readers) be more aware of love? Is my writing helping me (and my readers) be more aware of joy? If the answer to that is yes, then I am doing what I’m called to do. Don’t spend a lot of energy focusing on your fears or the hurdles in your life. Fear and distraction will always be there, nod your head at them from time to time, if you must, then get back to the work at hand. What’s typical day like in your household? During the school year, I get up at six and try to be downstairs on the couch, by the woodstove, with coffee cup in hand, by the time my daughter comes down fifteen minutes later. We start the day together quietly while she eats and I pack lunches. She is out the door at 7am and I quick, grab a shower before my twin boys explode out of their room at 7:10 with their older brother not far behind. I spend the next hour and a half reading aloud, packing lunches, finding missing articles of clothing, and pushing kids out the door. During that time, I also try to tidy a little, start a load of laundry or empty the dishwasher to get a jump on housework for the day. 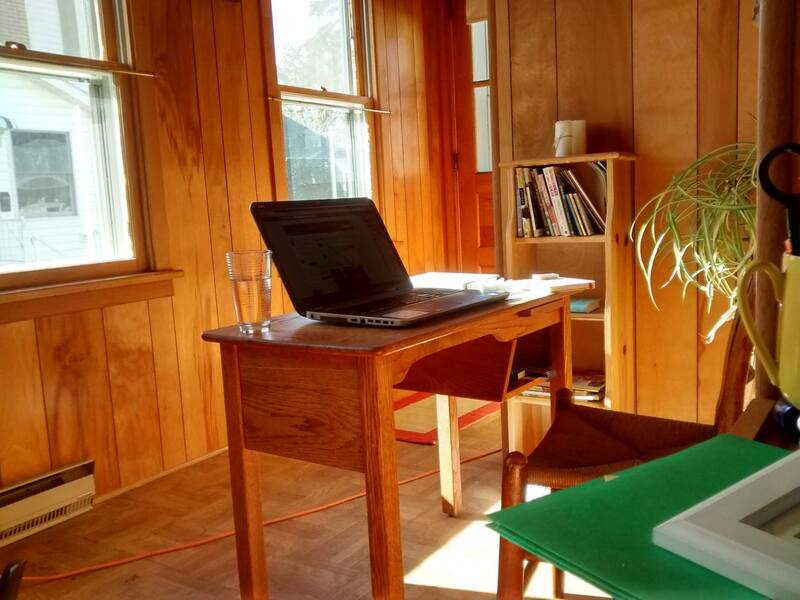 I write and offer Spiritual Direction in a little building about thirty feet from our main house. The office used to be a summer kitchen and, before that, a hen house. I try to be in my office with Coco (our dog) by 9 or 9:30 and work until around 1. I take frequent breaks to run into the main house and feed the woodstove, switch the laundry, and grab snacks. I also keep a painting space set-up in one corner of my office and find that adding a layer to something I’m working on offers a good timeout when I get stuck working with words. Some days I keep working until my daughter’s bus arrives at 3, but I often use the afternoon to run a never-ending list of errands. From 3pm on, my day is filled with housework and family time although, if a project demands, I can always head back out to my office once my husband gets home. All of this changes at the drop of a hat, though, if someone is home sick from school, during in summer months, and during times when I pick up other away-from-home work. How do you manage the balance of real life and creative work? (Especially with kids and family responsibilities). How do you carve out time to create? For me, carving out time to create, is like carving out time to eat or sleep or breathe. If I don’t do it, I suffer, and if I suffer, those closest to me tend to pay the price. We our kids were very young, I realized writing was key to my emotional and intellectual survival, so I hired a babysitter to come three hours a week. The minute arrived, I would drop everything, throw the babies at her, grab my laptop, and run out the door, like a woman fleeing a burning building. Having kids in school has made life more routine, but it remains unpredictable, especially during the summer months. – All of our kids have Quiet Time alone in their rooms for one hour every afternoon. This is non-negotiable. – I try to think about my writing time as a set block of time (say, an hour) that can be moved around depending on the demands of any particular day or week. For me, finding a balance between flexibility and discipline is key. – I occasionally keep a ‘time diary’ as a way to keep track of how I’m actually spending my time and, using the insights gained, make adjustments, like adding a little housework to my morning routine, that helps free up time later I the day. Why IS it important to write if you feel the call? What’s your advice to other writers and creative souls? Creative people need creative community – seek it out, invest in it, offer it to others. What do you know now that you wish you knew at 30? I know so much more now about who I am. The stripping down of false identity was a long and arduous process, but I think, if I’d had a glimpse of who I am now when I was 30, I would have been awed, amazed, and so very surprised. This is our “Hope & Wonder” issue. How do you keep those tenets alive in your daily life? Your creative life? Wonder, for me, is fueled by attention to what is. That’s why I find learning new skills (gaining new information) so helpful – when we are in learning mode, attention and focus are increased and we’re more open and aware process, more capable of surprise. Hope, for me, is fueled by storytelling. Writing about the crappy week when our car died and the kids were sick, or the time I was hospitalized for a nervous breakdown, helps me step outside my small, ego-centric perceptions of the world and allows me to embrace a larger narrative that seems to be hidden just behind (or beneath) all of the smaller stories of our lives – the one in which grace and mercy are new every day and love itself is what keeps us. 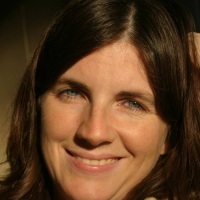 Kelly Chripczuk is a licensed pastor, Spiritual Director and writer who lives with her husband and four children in a 100+ year-old farm house in Central PA. She writes regularly online at www.thiscontemplativelife.org and for public speaking and retreats.